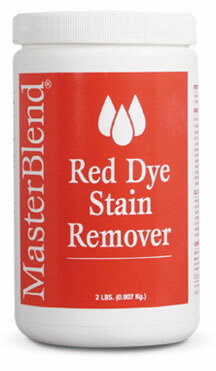 Very effective for removing stains from Kool-Aid®, red wine, grass, tea, food dye, and furniture stains. Unique chemistry enables Red Dye Stain Remover to excel at removing these stains and restoring carpet colors without costly cut and repair methods. Dissolves very rapidly and becomes active immediately. Environmentally safe, easy to handle and use-Economical. For best results, mix just prior to using. Mix 30ml( 1 oz.) (1 scoop) of Red Dye Stain Remover with120ml ( 4 ounces) of MasterBlend Upholstery PreSpray and 120ml (4 ounces) of water (use more product for very dark stains.) Shake well before using. Spray mixture over spot until completely moistened. Apply a steamer to carpet for up to 10 minutes or until spot disappears. Caution: some steamers have a "hot spot"� that may need to be partially covered with a towel to dissipate the steam. If spot is still visible repeat above process. When satisfied with results, rinse with cold water and blot dry. Pour any remaining liquid into a drain or toilet. Do not store in liquid form.